The family division agreement in a deceased estate is part of a vast old Babylonian legal corpus. It prima facie functions as a simple, straightforward agreement between family members. However, the different aspects of the agreement are not fully understood by today's scholars. This article offers some reflection on this specific agreement: the family division agreement in a deceased estate as a complex legal notion. In the article special attention is paid to what this agreement entails by explaining its practical and theoretical mechanisms. Reasons are given for categorising this agreement as a family division agreement deriving from a deceased estate in contrast with other types of division agreements from different estates. For practical reasons the different evolutionary stages in an estate are outlined. In relation to the theoretical mechanisms of the agreement, the relevance and meaning of recordings on objects in ancient Mesopotamia are discussed, with special reference to old Babylonian division agreements. In essence this agreement, as used in ancient Babylonian life, serves as a successful, timeless, estate administration mechanism and tool, to obviate any undesirable consequences of co-ownership of bequeathed property in the old Babylonian city-states. By the name of the king they have sworn. The aim of this article is to gain an understanding of this type of agreement, classified in a specific genre as a "family agreement from a deceased estate". This article explains what the agreement entails and why it is classified in a specific genre as a family agreement, and more specifically, as a division agreement deriving from a deceased estate concluded between the beneficiaries of the estate, namely the family members of the deceased owner. 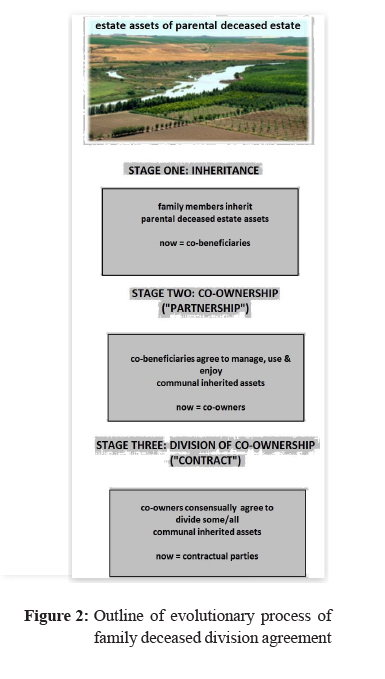 This agreement differs from other types of division agreements found in the dissolution of partnerships, living estate owners' estates and quasi adoption agreements.6 Prima facie, they function as the same type of agreement, since they all have one characteristic in common, namely the dissolution of co-ownership. However, each type has its own unique specific purpose and consequences. Every type of agreement embodies different constructions and solutions. This article focuses on the practical and theoretical mechanisms of the family division agreement in a deceased estate. It constitutes a complex legal notion. These outlines and explanations serve as background for future studies on the methodological approach7 in the case study of family deceased division agreement texts,8 as well as follow-up investigations into the different aspects and terminology of the division agreements, setting out their role and function in ancient Near Eastern law traditions and old Babylonian family life in general. This article first provides the different names assigned to a division agreement, followed by a simplified example of the practical mechanisms of a family division agreement in a deceased estate. In addition, the evolutionary stages in an estate are outlined, culminating in the conclusion of an agreement between contracting parties. Next, a reason is given for categorising this agreement as a family division agreement deriving from a deceased estate; as against other types of division agreements from different estates. The author further reflects on the theoretical mechanism of the division agreement in the discussion of the relevance and meaning of recordings on objects in ancient Mesopotamia, with special reference to old Babylonian division agreements. Subsequently, consideration is given to our present understanding of the ancient Near Eastern written medium, which differs from our own written medium and its functions. Lastly, the scribal schools' influence on the recorded objects is discussed. 2 Different names assigned to the family division agreement in a deceased estate, called the "division agreement"
In ancient Near Eastern studies, different names have been assigned, for example, to a division agreement, a partition agreement, a partition or an allotment.12 This is probably the result of different scholarly influences on the terminology used in legal systems of different times and places. 3 Practical mechanisms of a division agreement: What does it entail? What an old Babylonian family deceased division agreement entails is explained in a simplified example: An estate owner dies. His estate consists of fields, implements, stock and slaves. Each of his three sons, as a beneficiary in accordance with the inheritance, receives a third share in undivided ownership in the bequeathed property. One son is a merchant, another a priest, and the youngest a farm manager who assisted his late father on the farm. The youngest beneficiary wishes to inherit the farm so that he may fulfil his dreams and aspirations as a farmer. The other two brothers/beneficiaries have no intention of farming. If the three beneficiaries are to escape the perils of co-ownership, they can sell the asset(s) and divide the proceeds into one-third shares. This will result in the alienation of the corpus of the assets. Alternatively, they can retain ownership and escape some of the problems of co-ownership by leasing the asset(s), and sharing in the rental income. As another option, the brothers/co-owners can decide to enter into a division agreement that awards the fields, implements and slaves to the youngest beneficiary, who wishes to continue farming. The other two brothers can then either receive sole ownership of other estate assets, equal to the monetary value of the farm, which constitutes an exchange, or they can donate the farm to the youngest sibling. Another method of division would be for the youngest son to pay his brothers a sum of money to the value of the amount by which he has been enriched. The assets in the estate are thus reshuffled by means of a sale, a donation and/or an exchange. The above example reflects some of the dynamics of recorded division agreements in the old Babylonian period. The essence of a division agreement was to find a practical solution so that beneficiaries in a deceased estate could avoid the undesirable consequences of co-ownership of property they had inherited together, and could reap the benefits of sole ownership. In good times, when a family shares communal property, or there is a partnership of co-ownership, peace in a family is maintained. But matters are not always clear-cut. The nature of co-ownership in undivided shares may give rise to difficulties that compel stakeholders to opt for its dissolution. Co-ownership of communal inherited asset(s) received from a family member's deceased estate is dissolved by means of a family deceased division agreement. See table format infra explaining the different stages that are followed in reaching such an agreement. This serves as a practical example of the process. Stage one: In a kinship group, where the owner of an estate makes bequests to his or her beneficiaries, on his or her death more than one beneficiary has equal shares in one or more assets in the deceased estate. A defined bequeathed fraction of an estate is left to each chosen beneficiary. As a practical outcome, the beneficiary becomes a co-beneficiary in undivided shares of the bequeathed property in proportion to his or her share. These beneficiaries are closely related in a family kinship relationship, by either a biological relationship or a contractual relationship by means of an adoption. Stage two: The co-beneficiaries now become co-owners and as "partners" they manage, enjoy and use the property as co-owners.When things are going well, peace is maintained; however, when things are not going well the co-beneficiaries may for various reasons decide it is essential to terminate their co-ownership. Stage three: At this stage, because of conflict or uneasiness about sharing the communal assets, the co-owners decide to divide some or all of the originally received inherited assets so that instead of being co-owners they will be sole owners of some or all of the communal shared assets. This is more easily said than done for the co-owners who now become contracting parties must agree to divide the communally held property, which possibly has monetary and/ or sentimental value. There may also be problems of an agricultural and/or architectural nature. On the conclusion of the agreement, each contracting party will forfeit ownership of a certain asset or assets in order to gain sole ownership of another asset and/or assets. In other words, some "trading" of the assets takes place. The various evolutionary stages of a family deceased division agreement culminate in the final stage, the conclusion of the agreement. The family division agreement in a deceased estate is a complex legal notion. Potentially, in one agreement beneficiaries can choose to effect the division by means of sale, exchange or donation or more than one of these. These different legal constructions reflect the uniqueness of the solutions in each agreement and serve to some extent to demonstrate the specific legal practices of a particular old Babylonian city-state and the special circumstances of each family concerned. However, there are other division agreements apart from the family division agreement in a deceased estate, such as a quasi-division agreement in an adoption agreement (quasi-adoption agreement), a living estate owner's division agreement between his future beneficiaries, and dissolution of partnership in old Babylonia, which prima facie is similar. The similarities of these types of agreements emerge when a division agreement needs to be distinguished from other legal notions such as sale, donation, exchange, etcetera. The division agreements all include one specific term, namely that the contracting parties agree to the terms of the agreement. Specific terms used by the old Babylonian scribes from the city-states Larsa, Nippur and Sippar were the Sumerian term ba and the Akkadian terms se-ga-ne-ne-ta and i-zu-zu. Another similarity is that the contracting parties in each division agreement have at least one similar aim, namely the dissolution of co-ownership. However, if division agreements are further classified into subgroups it will be seen that each type of agreement embodies the particular aims and consequences of the contracting parties. The following discussion reflects the nature and character of each type of agreement in respect of its solutions and consequences.17 The comparison shows that the quasi-adoption agreement, family agreement from a living estate, and partnership agreement all entail more than the dissolution of co-ownership as in the family division agreement from a deceased estate, discussed above. The named quasi adoption agreements display elements similar to those in other division agreements. The motivation for the quasi adoption agreement is not only to divide the communally owned assets in such a way that sole ownership ensues, in order to escape the perils of co-ownership; other reasons play a specific role in the conclusion of the adoption agreement, which includes the adoption of a future beneficiary of the adopted parent's estate.18 The quasi adoption agreement consists of the division agreement of a living estate owner containing an adoption clause. Damiq-ilisu son of Iddinya has adopted Ilum-gamil the eldest brother, Mar-esetim his brother, and Ilsu-bani his brother as his heirs. They will divide equally, by casting lots, the house, field, (and) orchard - all that there is of the property of Damiq-ilisu. If Damiq-ilisu says to Ilum-gamil, Mar-esetim, and Ilsu-bani his sons, "You are not my sons", he will forfeit the property of his father [...]. If Ilum-gamil, Mar-esetim, and Ilsu-bani say to Damiq-ilisu [their father], "You are not my father," [they will pay] 1/2 mina of silver. In mutual agreement they have sworn in the name of the king. When property in a deceased estate is divided, a division agreement is concluded only between the beneficiaries of the person who owned the deceased estate, generally the father or mother or in some instances a deceased brother or uncle. One way in which the so-called guasi-adoption contracts differ from the deceased estate agreements is that in the former the property is divided while the estate owner is alive and he or she is one of the parties to the agreement. The estate owner adopts a third party and usually the adoptee becomes a contracting party. The contracting parties of guasi-adoption contracts are the living estate owner, appointed future beneficiaries of the estate and adopted kinship members. However, the living estate owner plays a very important role in negotiations and in some agreements his or her suggestions are decisive. A quasi-adoption agreement is in its essence neither a deceased division agreement nor an adoption agreement. Both the guasi-adoption and deceased division agreements make provision for a change from co-ownership to sole ownership. However, the guasi-adoption and adoption agreements have in common an adoption clause while the estate owner is still living. The same mechanism occurs in the dissolution of a partnership but in that agreement the reason for a change from co-ownership to sole ownership is different from that in a family deceased division agreement. Here the contracting parties and partners are usually not related, and the partnership was established and maintained for business purposes. Erib-Sin and Nur-Samas conducted a business on a partnership basis, and then entered into the temple of Samas and made their reckoning, and the money, debts, female and male slaves, what of the way (sic) as well as within the city, they equally divided, and the settled up their business. That in regard to money, male and female slaves, and debts, what of the way (sic) as well as within the city, from chaff to gold, one will not bring suit against the other, they have invoked the name of Samas, Aja, Marduk, and Hammu-rabi. Lines 18-34 (Witnesses). Before Awil-ilim, etc. For different reasons the partners do not wish to continue their partnership and they agree to its dissolution employing the same term "mutual agreement". However, here the reason for and nature of co-ownership differ from that in the family division agreement from a deceased or living estate, as well as that in a guasi-adoption agreement. In the division agreement of a living owner's estate the agreement is a family agreement. When the dissolution of co-ownership is agreed upon, the estate owner is still living (as in the instance of the guasi adoption agreement) and he or she plays an important role in giving instructions concerning the division of the estate assets. This is in contrast with the deceased division agreement and similar to a guasi-adoption agreement with the further consequence that a fideicommissum or usufruct construction forms part of the consensual agreement's provisions. In a Nippur example from Stone and Owen28 the text is a recorded division agreement between the living parents Awiliya and Narumtum and their sons, Ibbi-Enlil, Ilsu-ibnisu and Ilima-abi. It seems that the sons received the assets of the paternal estate as heirs/ beneficiaries of their mother, Narumtum, subject to certain conditions. Exactly when the sons would receive the assets as heirs/beneficiaries, is not clear: it could either be upon the death of their father or during his lifetime. However, the property probably devolved upon the sons after the father's death, at which time the sons, in exchange for the property's use, would give their mother Naramtum certain rations. This can be considered a fideicommissum construction, which differs from the Roman law's fideicommissum and needs to be defined. It also contains some elements of a Roman law usufruct construction. The sons by agreement received the assets in the paternal estate on condition that they gave their mother a certain portion of them. Regardless of how much the property produced, the exact portions had to be distributed or else, as a sanction, the sons would forfeit the property. In additon, their mother could not receive more than her portion. She did not have an unlimited right of possession over the fruits of the assets, nor did she control the property, although she seems to have been the co-owner. She received some amount of predetermined maintenance from her sons during her lifetime. This is a unique legal institution. She and her sons were owners, yet each party had different rights, and these rights were limited, especially the mother's. Awilya son of Warad-Sin has married Naramtum daughter of Sinatum. Awiliya has given Ibbi-Enlil their heir and eldest son, Ilsu-ibnisu his brother, and Ilima-abi their brother to Naramtum his wife as heirs. To Ibbi-Enlil the heir and eldest son, to Ilsu-ibnisu his brother, and to Ilima-abi their brother, house, field orchard, male and female slaves, and household goods. Awiliya their father, after the eldest son has taken his preference portion, will divide by lot among them equally. If Awiliya says to Naramtum his wife, 'You are not my wife,' he will pay / mina of silver. If Naramtum says to Awiliya her husband, 'You are not my husband,' he will shave her and place a slave mark on her and giver her for silver. If Ibbi-Enlil, Ilsu-ibnisu, and Ilima-abi his brothers say to Naramrum their mother, 'You are not our mother,' they will forfeit the property of Awiliya their father. If Narumtum says to Ibbi-Enlil, Ilsu-ibnisu and Ilima-abi her sons, 'You are not my sons,' Naramtum will [...] the property of Awiliya her husband. [...] heirship [...]. Ibbi-Enlil [the heir and eldest] son, Ilsu-ibnisu, and Ilima-abi his brothers will provide [an annual ration of] 2 gur 2 pi of barley, 6 mina [of wool, and x sila of] oil to Naramtum their mother. Any heir who fails to provide the barley, wool, and oil rations will forfeit his father's property. In mutual agreement they have sworn in the name of the king. The primary source of an old Babylonian family deceased division agreement is a written summarised recording of its details on a clay tablet. What follows is a reflection on the relevance and meaning of the predominantly preliterate communication media of ancient Mesopotamian society and our possible misunderstanding of the written media of old Babylonia. Special attention is accorded to old Babylonian scribal school traditions and the relevance and meaning of written recordings on objects, as a background to the significance of recorded old Babylonian division agreements in the scribal school traditions. The distorted-mirror43 effect provided by recorded legal transactions is all that is available to provide some insight into and understanding of the relevance of written legal recordings in old Babylonian life. It is only through constant studying, debating, and translation of more cuneiform records in years to come that we may hope to reach a better understanding and a more accurate picture of the relevance of written recordings of old Babylonian life and its legal traditions. Some insight into old Babylonian scribal schools and their scribes is necessary for an understanding of the unique nature of the recording of the details of a family deceased division agreement. Through the recording the scribe has made it possible for us to gain some insight into and knowledge of this agreement, albeit subject to the scribe's view of which facts and details to record; which also depended on his/her scribal school tradition and training. The primary source of an old Babylonian family deceased division agreement is a written summarised recording of its details on a clay tablet. Therefore, our conception of this agreement is only that of a three-dimensional artefact whose details were captured by a scribe at his/her own discretion at a specific time and place. It was still a complex agreement, though, in which lengthy negotiations often preceded a final consensus between the family contracting parties. Generally, the details mentioned below are included in the agreement/protocol, although these details depend on several factors, such as the city-state's various scribal school traditions, scribal school practices, the specific circumstances of each case and the details chosen by the scribe:69 (1) names of the parties and the relationship between them reflected in a statement of their own standing within their family; (2) name and standing of the deceased estate owner; (3) description of the property awarded to each contracting party; (4) witnesses70 present and, in most instances, their names, status and sometimes also their profession, together with witness seals71; (5) name of the scribe, and sometimes his seal;72 (6) sometimes the "date" of the attestation of the oral agreement;73 (7) contracting parties who swore an oath, mostly indicative of the time and place of the agreement, usually by the name of the reigning king and god or gods of the city or "personal" god; and (8) usually parties stated that they would not make further claims. When reflecting on the written significance of, for instance, a family deceased division agreement in old Babylonian society, we must be cautious in our interpretation, so as not to superimpose modern concepts of written agreements, their importance, relevance and functions onto old Babylonian written agreements. Scholars should constantly reorient themselves towards a better understanding of the dynamics and concepts of old Babylonian written agreements and their significance for the parties involved in those agreements. The old Babylonian scribal schools and their scribes reflect the unique nature of the recording of the details of a family deceased division agreement. Through the recording the scribe made it possible for us to gain some insight into and knowledge of this agreement albeit filtered through the scribe's emphasis of certain facts and particulars that he/she considered important, which in turn was influenced by his/her scribal school tradition and training. Particulars of the terms agreed upon and of the contracting parties, or in some cases only one contractual party in the oral family deceased division agreement were recorded on a clay tablet as possible documentary evidence. Most of the background and minute details of the oral division agreement are not reflected on the clay tablet; the recording only reflects what the scribe chose to record according to his/ her scribal tradition in a city-state. Essential elements may be identified as prerequisites of a specific oral and recorded agreement, such as a family deceased division agreement. However, it is a fortunate bonus when legal practices (natural elements)75 are also recorded, especially in a largely oral society such as ancient Mesopotamia, including old Babylonia, based on multisensory communication and symbolism. As a practical consequence, the agreement is concluded immediately after the death of the family estate owner or some time later in respect of some or all of the assets. In most cases co-ownership gives rise to problems where more that one heir inherits the deceased family estate assets. To escape the perils of co-ownership, the beneficiaries agree to divide the inherited communal asset(s). On the conclusion of the division agreement, the party who is awarded the assets enjoys sole ownership whilst the other parties agree to give up their ownership. This is what a study and interpretation of recorded old Babylonian division agreements yields. During the final stage, the agreement itself is a complex legal notion and potentially, by choice between contracting parties in one agreement, may take the form of one or more of three legal constructions, namely sale, exchange or donation. However, there are other agreements - such as guasi-division, adoption, living estate owner division, dissolution of partnerships - that similarly involve dissolution of co-ownership, yet also have unique objects and various mechanisms and consequences. Therefore the particular details of the family deceased division agreement needed to be identified in this article. To accomplish this certain issues were addressed. The various evolutionary stages of a family deceased division agreement culminate in the final stage, the conclusion of the agreement. In the first stage the co-beneficiaries share an inheritance received from a family deceased estate. In the next stage, these co-beneficiaries become co-owners and together manage the acquired inheritance. The final stage is when the co-owners become contracting parties and reach a mutual agreement on some or all of the assets or a division of the asset(s) into agreed awarded portions. The result of the family deceased division agreement is the dissolution of co-ownership. Thus the essence of a family division agreement in a deceased estate in old Babylonia is to obviate the undesirable consequences of co-ownership by means of an exchange, sale and/or donation of the common bequeathed property. In this function it is a successful and timeless estate administration mechanism and tool. 2 The old Babylonian period is the period which scholars today recognise as the Mesopotamian period of around 2000-1600 BCE during which thousands of textual sources were excavated, some of which were deciphered, translated and discussed as from the second half of the nineteenth century. 4 HV Hilprecht The Babylonian Expedition ofthe University of Pennsylvania Series A Cuneiform Texts (Philadelphia, 1909) 20-25; A Poebel transliterated and translated the agreement from the cuneiform tablet and added some commentaries. 5 Hilprecht (n 4) at 20-21. In order to avoid confusion, the Sumerian terms are shown in bold font format and the Akkadian terms in italics font format. 6 Scholars conducting explorations, excavations, investigations and discussions during the nineteenth century had limited information of a general and specific nature on the rural and city landscape of the ancient Near East. Topics included agreements featuring sales, divisions and agreements pertaining to land ownership. Scholars were especially influenced by two stories that offered a "strong mythical flavor and appeal": First, the story of the Tower of Babel served as a "metaphor for a town" and, secondly, the Garden of Eden was a "metaphor for the countryside". These two metaphors "characterised" the elements of rise and fall. The Tower of Babel gave rise to the concept of the city as "unfinished and abandoned" and the Garden of Eden as "closed for humankind": see M Liverani "Reconstructing the rural landscape of the ancient Near East" (1996) 39 J of the Economic and Social History of the Orient 1-41 at 1-2. Scholars in the second half of the nineteenth century found ruins instead of houses and a desert instead of a garden, and thus the early approaches of scholars were covered in a shroud of negativity. Their explorations, excavations and investigations during the second half of the nineteenth century show a different picture, though later discussions focusing on different aspects of landscape and city life were more productive owing to the availability and aid of textual and archaeological sources of which many thousands of uncovered clay tablets are still to be transliterated, and/or translated and discussed by scholars (idem at 2). Amongst the corpus of contributions are: MdJ Ellis "An agricultural administrative archive in the free library of Philadelphia" (1977) 29 J of Cuneiform Studies 127-150 regarding an agricultural administrative archive; RC Ellickson & CD Thorland "Ancient land law: Mesopotamia, Egypt, Israel" (1995) 71 Chicago Kent LR 321-411 made an overall study of land law in Mesopotamia, Egypt and Israel; JM Renger "Institutional, communal, and individual ownership or possession of arable land in ancient Mesopotamia from the end of the fourth to the end of the first millennium B.C." (1995) 71 Chicago Kent LR 269-319 gives an account of institutional, communal and individual ownership or possession of arable land in ancient Mesopotamia from the end of the fourth to the end of the first millennium; M Stol "State and private business in the land of Larsa" (1982) 34 J of Cuneiform Studies 127-230 discusses state and private business in the land of Larsa; M Stol Studies in Old Babylonian History (Istanbul, 1976) passim provides information on the chronology, geography, political and social organization of old Babylonia; EC Stone & ET Stone "Texts, architecture and ethnographic analogy: Patterns of residence in old Babylonian Nippur" (1981) 43 Iraq 19-33 examine the patterns of residence in old Babylonian Nippur, while E Stone & DI Owen Adoption in Old Babylonian Nippur and the Archive of Mannum-mesu-lissur (USA, 1991) passim in their discussion of adoption agreements of old Babylonian Nippur and the Archive of Mannum-mesu-lissur investigate the residence patterns and city and rural landscape. 7 In a recent unpublished doctoral thesis by the author the Babylonian family deceased division agreements from the old Babylonian city-states Nippur, Sippar and Larsa were synoptically outlined. An analysis-method approach was developed by the author to identify the group structures used in the analysis of old Babylonian division agreements, which include the details and reasons for the different elements present in an oral and recorded agreement. The contents of a division agreement are classified within two main groups, namely the essential and natural elements reflecting the oral agreement between the parties and incidental elements found in the written division agreement because of scribal traditions. See SJ Claassens "Family Deceased Estate Division Agreements from Old Babylonian Larsa, Nippur and Sippar" (D Litt et Phil, University of South Africa, 2012 vols 1 and 2) esp at 107-150. This article is based on some of its findings. 8 Forty-six chosen agreements in a content analysis were studied through the approach that categorised the above elements. The chosen forty-six division agreements of Larsa, Nippur and Sippar originated in the following old Babylonian periods: from the city state Larsa ten division agreements were studied dating from the reigns of Rim Sin I, Rim Sin II until the First Dynasty of Babylon, and also from the reigns of Hammu-rabi and Samsu-iluna (texts and discussions from D Charpin Archives Familiales et Proprieet Privee en Babylonie Ancienne (Geneve, 1980) passim; WF Leemans Legal and Economic Records from the Kingdom of Larsa (Leyden, 1954) at 34-38; J Andersson "Some cuneiform texts from the Haldar Collection: Two old Babylonian contracts" (2008) 8 Orientalia Suecana at 5-22. Ten division agreements from Nippur were chosen from the First Dynasty of Isin under the reign of Damiq-ilisu, the Larsa Dynasty from Sin-iqisham, Rim Sin I, Rim Sin II and the First Dynasty of Babylon during the reign of Samsu-iluna (texts from O'Callaghan "A new inheritance contract from Nippur" (1954) 8 J of Cuneiform Studies at 137-143; E Chiera Old Babylonian Contracts vol 8 (Pennsylvania, 1922) at 51-54; Hilprecht (n 4) at 20-21, 23-27; Stone & Owen (n 6) at 54-67, 8789. Twenty-six division agreements deriving from old Babylonian Sippar were chosen (texts from M Schorr Urkunden des Altbabylonische Zivil- und Prozessrechts (Leipzig, 1913) at 197, 249-250, 252-261; L Dekiere Old Babylonian Real Estate Documents from Sippar in the British Museum/Pre-Hammurabi Documents (Ghent, 1994) at 108-110, 163, 164-167, 173-175, 195, 253-255, 269-273; L Dekiere Old Babylonian Real Estate Documents/Post-Samsu-Iluna Documents (Ghent, 1995) at 82-83, 115-117, 148-149; A Goetze "Old Babylonian documents from Sippar in the collection of the Catholic University of America" (1957) 150-160 J of Cuneiform Studies at 15-40; TG Pinches Inscribed Babylonian Tablets in the Possession of Sir Henry Peek (London, 1888) at 59-61; and GS Duncan "Babylonian legal and business documents from the first Babylonian dynasty, transliterated, translated and annotated" (1914) 30 The American J of Semitic Languages and Literatures at 166-195. These Sippar texts were from the period of the Larsa Dynasty during the reign of Sin-iddinam and the greater part of texts in the First Dynasty of Babylon during the reigns of Apil Sin, Sin-muballit, Hammu-rabi, Samsu-iluna and Ammisaduqa. In Claassens (n 7) vol 1 at 211-410 reference is made to some findings on these agreements that use the analysis-method approach (see (n 7) vol 1 at 107-150) so as to explain and substantiate the approach that may be used in the future to study this legal notion. 9 In South African law, jurists have a certain conception of the historical development of redistribution agreements (for the sake of convenience here referred to as division agreements). South African jurists consider Roman-Dutch law as the common-law source of division agreements. Roman-Dutch scholars such as Grotius, Voet and Huber are the main proponents of this view. In the light of these scholars' contribution to division agreements, it is important to note the similarity in the elements, mechanisms and solutions of division agreements in Roman-Dutch law and South African law, on the one hand, and old Babylonian law, on the other. Grotius refers to a certain kind of joint inheritance in which brothers share in an inheritance that includes "everything, corporeal or incorporeal, belonging to or possessed by the deceased; also whatever has accrued to the inheritance, together with all benefits and profits ... But it has been practiced from olden times where there were two children for the elder to fix the shares, and for the younger to choose": see AFS Maasdorp The Introduction to Dutch Jurisprudence of Hugo Grotius (Cape Town, 1903) at 297-298. J Voet Commentarius ad Pandectas (tr P Gane The Selective Voet, Being the Commentary on the Pandects) vol 2 (Durban, 1955) 10 2 2 states as follows: "As regards the division which takes place by mutual consent of coheirs and without the offices of an arbitrator, it is fettered by no fixed rules, but is carried out in the manner and on the principle which has appeared to the persons dividing to be the more advantageous and convenient. Either they decide that the elder divides the property and the younger one chooses; or it may rather have taken their fancy first to make a distribution of the property and then to settle by lot to whom each single share ought to fall; or they may have preferred to make a valuation of the properties in the inheritance and to have mutual bidding with a rise, and thus to let each single property go to him who has come off best in the bidding or the plan may be that the whole right in the inheritance should stay with one person, and that he shall pay the rest a fixed amount of money". (See Nippur texts in Claassens (n 7) vol 1 at 265 in respect of lots being drawn.) U Huber Heedensdaegse rechtsgeleertheyt (tr P Gane The Jurisprudence of My Time (Heedensdaegse rechtsgeleertheyt) vol 1 (Durban, 1939) 3 29 16 states the following: "When the property is such that it cannot be divided, and the shares are almost equal, the one may propose to the other to give or take: or if neither is willing to do that, then the co-owners may use it in turns; otherwise he who has the least share must take money for his portion, at the appraisement of arbitrators." In South African law, a few court cases may be mentioned for these purposes. In The Testate Estate of John Mcdonald (1897) 18 NLR 156-157 the South African court explains the rationale of a division (redistribution) agreement that if it is found "impossible under the circumstances to administer and distribute the estate in terms of the will" the heirs must enter into a division (redistribution) agreement. 10 Cf SJ Claassens "Herverdelingsooreenkomste in die beredderingsproses van bestorwe boedels" (20042005) 1 Tydskrif vir Boedelbeplanningsreg at 36-102 who discusses the origins of the contemporary South African redistribution (division) agreement in Roman and Roman-Dutch law. The author stresses that the statutory measures are not a codification of the rules governing redistribution agreements, and that their ambit and implementation in the estate administration process should be viewed within a wider context. 11 AC Mitra The Hindu Law of Inheritance, Partition, Stridhan and Wills (Delphia, 2010) at 63-133. 12 See discussion by Claassens (n 7) at 1-2; further the discussion of some old Babylonian division agreements from Tell Harmal by MdJ Ellis "The division of property at Tell Harmal" (1974) 26 J of Cuneiform Studies at 133-153. 13 However, this does not solve the problem of studying it as it is found in the textual sources of the old Babylonian Period (including other periods in the ancient Near East). When the written agreement inscribed on a clay tablet that must be compared to today's law and, in particular, the law of succession was studied, care was taken not to superimpose today's scientific framework onto the framework of the old Babylonian oral legal transactions, especially with regard to their recording and the meaning of the oral and written legal transactions of the old Babylonians. Cf Malul (n 3) passim. 14 A comment by Voet (n 9) at 10 2 1-9. He gives a synoptic outline of aspects of co-ownership and discusses the so-called Roman legal notion of the judicium familiae erciscundae which may be translated in the widest context as the division of a family estate or inheritance. Today in South African law Voet's notes on division agreements constitute one of the sources of the South African law on division agreements (redistribution agreements). See Claassens (n 10) passim. 15 See Claassens (n 7) vol 1 at 51-61. In the division agreement there are certain contractual terms that are expressly or tacitly included by co-owners. At 127-131 she identifies these terms as "natural elements". The natural elements (Nat) comprise the choices from law and practices in old Babylonian Larsa, Nippur and Sippar. Examples: Nat1 adoption/support; Nat2 bringing in/equal shares; Nat3 division by lots/in good will; Nat4 heart is satisfied; Nat5 as much as there is/completely divided/from straw to gold; Nat6 no claim; Nat7oath in temple/oath; Nat8 preference portion; Nat9 sanction clause; Nat10 trust (trustee); Nat11 usufruct; and Nat12 witnesses. 16 In contemporary South African law the division agreement, named the "redistribution" agreement, can be an element of the finalisation of the administration of a deceased estate. The mechanisms used in the old Babylonian family deceased division agreement are the same as those used in the "redistribution" agreement in South Africa. In Klerck v Registrar of Deeds 1950 (1) SA 626 (T) at 630-631 Dowling J referred to sale, donation and exchange as "vehicles of redistribution", and said that "some sort of reshuffle of assets" in the estate took place under a redistribution agreement. The scope of this article does not permit a discussion of the possible reception or transmission of a division agreement from the ancient Near East to Roman and Roman-Dutch law and then to South African law. However, this is still an open question that could be investigated in a further study. In "Aspects of reception of law" (1996) 44 American J of Comparative Law 335-351 at 335 A Watson states that "[r] eceptions come in all shapes and sizes: from taking over single rules to (theoretically) almost a whole system. They present an array of social phenomena that are not easily explained: from whom can one borrow, in what circumstances does one borrow? The question remains: in what circumstances does one borrow?" See also discussion by Claassens (n 7) vol 2 at 451-455. 17 The length of this paper does not permit a detailed discussion of each kind of agreement. Further study of these agreements and a more detailed investigation of each kind of agreement structure and its aim and function may reveal complicated legal practices and the provision of different solutions to problems within the family and business milieu. 19 PR Obermark Adoption in the Old Babylonian Period (PhD, Hebrew Union College, 1992) passim. 20 Stone & Owen (n 6) passim. 21 Nippur, the ancient city that is today called Niffer, lies near the city of Diwaniyah. To reach Nippur in the 1880s it was necessary to travel by boat. During the Mesopotamian period, however, the city was situated on the Euphrates river and linked with Sippar in the north and Shuruppak in the south: see G Leick Mesopotamia. The Invention of the City (London, 2001) at 141. According to Leick (at 143) Nippur is sometimes considered by scholars as "a town of academics, a Mesopotamian Oxford or Cambridge", a city that owns a "reputation as much for intellectual snobbery as for erudition in obscure disciplines". At 162 she states that "an unusually complex collection of written material" was unearthed, mostly in Sumerian. There were numerous scribal schools (edduba) until King Samsu-iluna's reign when something catastrophic happened and the Nippur population declined. At the so-called "Tablet" Hill 60 000 cuneiform tablets were excavated. These contained a rich variety of Sumerian literature, including the Sumerian Great Flood story. This hill is considered a "campus for student scribes and teachers": see S Bertman Handbook to Life in Ancient Mesopotamia (New York, 2003) at 28. 22 See Stone & Owen (n 6) at 43-44 (text from the collection of MCH Kizilyay & FR Kraus Altbabylonische Recthsurkunden aus Nippur (Istanbul, (Istanbul, 1952) plate at at 45). 23 Afideicommissum is a legal institution applied in Roman law for several centuries and still in use in some contemporary Western legal systems. It derives from the Latin word fides (trust) and committere (to commit), meaning that something is committed to one's trust. For the purposes of this article, it means a benefit awarded to a beneficiary, subject to the obligation to award it to another: see also M Kaser Romisches Privatrecht (tr R Dannenbring Roman Private Law) (Pretoria, 1984) at 381-386. In South African law, in terms of a fideicommissum, the fiduciary will acquire a vested right in the property and if the fidecommissaries fails to acquire the property, it will revert to the fiduciarius. In a usufruct, on the other hand, a usufructuary can never acquire a vested right in the corpus of the property and will only receive the fruits of the property. Thus one must establish who will become the owner and what the limitations of this ownership are. If the beneficiary becomes the owner, it is a fideicommissum. If the beneficiary becomes an owner subject to the use and enjoyment of "an intermediate beneficiary" then a usufructuary will receive the fruits of the property for his or her own purposes: see MJ de Waal & MC Schoeman-Malan Law of Succession (Cape Town, 2008) at 167. 24 A usufruct is a Roman-law institution and term, still in use today in some Western legal systems. It derives from the Latin word usufructus meaning "using the fruit" of land. For purposes of this article, it means the right to enjoy the use of another's property for a specific period, which may even be a lifetime, as long as the property is maintained in reasonable order. See Kaser (n 23) at 148-152: In South African law, a usufruct is a "personal servitude giving the usufructuary a limited real right to use another person's property and to take its fruits with the obligation to return the property eventually to the owner, having preserved its substantial quality". According to De Waal & Schoeman-Malan (n 23) at 166 the rationale for this legal institution is to make provision for the usufructuary to receive income for a certain period. The usufructuary is not the owner; but while there is a usufruct the owner cannot use, enjoy or take the fruits of the property. 25 Other Roman legal concepts now in use in contemporary law can help us define these Mesopotamian legal institutions. Two legal concepts discussed in this article, namely usus (use) and habitatio (dwelling), should be applied with caution. They are personal servitudes, in terms of which beneficiaries are granted the right to use a property subject to certain limitations or to live on it: see De Waal & Schoeman-Malan (n 23) at 168. In usus, not only the beneficiary but also the members of his or her household are granted the right to use the property and to enjoy its fruits insofar as they provide for the beneficiaries' maintenance needs, not to makea profit. The corpus of the property must stay intact: see SW van der Merwe et al Contract General Principles (Cape Town, 2007) at 521-523. Habitatio is the granting of the right to the beneficiary and his or her family to live, for instance, on the property; additionally he or she can let the property and live somewhere else (idem at 523-524). 26 See Stone & Owen (n 6) at 40-41 (text Texts in the Iraq Museum (TIM) 4 14). See, also, the text in Stone & Owen (n 6) at 47-48, Babylonian Expedition of the University of Pennsylvania, Series A Cuneiform Texts (BE) 06/2, 57, tr and publ as follows: "Tab-balatu son of Etel-pi-Samas and Beltiya his wife have adopted Habil-ahi as their son. They will divide equally by lots house, field, and household property - all that there is - after Ninurta-gamil the eldest son has taken his preference portion. Ninurta-gamil his brother will not make a claim against the tablet of heirship of Aplum the gala or the temple offices, fields, house, and orchards of Habil-ahi. If Tab-balatu and Beltiya his wife say to Habil-ahi their son, 'You are not our son,' they will pay '/ mina of silver. And if Habil-ahi says to Tab-balatu and Beltiya, 'You are not my father, you are not my mother,' they will shave him and place a slave mark on him and give him for silver." 27 See Duncan (n 8) at 188-189 for transcription and translation of the text. 28 See Stone & Owen (n 6) at 51-52 (text from Babylonian Expedition of the University ofPennsylvania, Series A Cuneiform Texts (BE) 6/2 48). 30 M Malul Studies in Mesopotamian Legal Symbolism (Neukirchen, 1988) at 449-450 stresses the importance of remembering that the functional goal of written documents was only to capture the most important details of the agreement. Furthermore, the symbolic act, or at least its ceremonial details, were not always pertinent in the document; but this does not mean that these acts had to be written to have any effect or value; they played a vital role in the performance of the legal act. 31 See BJ Hibbits "Coming to our senses: Communication and legal expression in performance cultures" (1992) 41 Emory LJ 873-960 esp at 874. 32 The material of the written media varied. In most cases (and possibly only because clay survived the ravages of time) the written records were incised on clay tablets. Other materials included leather, papyrus, stone, metal, ivory, wood wax boards, etc. See LE Pearce "Scribes and scholars in ancient Mesopotamia" in JM Sasson et al (eds) Civilizations of the Ancient Near East (New York, 1995) at 2269-2270, 2265-2278. 33 Hibbits (n 31) at 874. 34 See Claassens (n 7) vol 1 at 151-210. 35 Hibbits (n 31) at 874. 36 Ancient Mesopotamian documents survived in enormous quantities because of the indestructible nature of the dried and baked clay and are still being excavated, deciphered, translated and examined by scholars of the ancient Near East. Most of these documents deal with economic issues, sales of land and school loans. There are also royal inscriptions (kings' military campaigns and building projects), historical inscriptions, despatches, private and general letters, myths, proverbs, practice tablets as well as mathematical, astronomical and other scientific texts. In addition there is an array of legal sources, such as deeds, conveyancing documents, bonds, receipts, accounts and legal decisions which we would call contracts, decrees, instructions, judicial decisions or court judgements, lexical texts, transactional records, historiographical documents and literature. See, in this regard, R Westbrook (ed) A History of Ancient Near Eastern Law (Leyden, 2003) at 5-6; K Veenhof "Before Hammurabi of Babylon: Law and laws in early Mesopotamia" in FJM Feldbrugge (ed) The Law's Beginnings (Leyden, 2003) at 137-161. In the old Babylonian period one source, called the law collections, plays a significant role in many modern scholars' perceptions and discussions of the "source" of legal tradition. In the past decades, there has been much debate over the function of these law collections. See discussion and outline in SJ Claassens "The so-called 'Mesopotamian law codes': What is in a name?" (2010) 19(2) J of Semitics at 461-478. 37 MA Powell "Three problems in the history of cuneiform writing: Origins, direction of script, literacy" (1981) 15 Visible Language 419-440 re-evaluated the origins of cuneiform (well-known established date: 3000 BCE); the direction of script; the manner of use of stylus and tablet; and the role of cuneiform in literacy in the introduction of the alphabet. At 436 he concluded: "The inescapable conclusion is that the introduction of the alphabet, by itself, has had little effect upon reduction of functional illiteracy, and thus, its importance in the history of human development has been overestimated, whereas that of cuneiform has probably been underestimated." 38 Hibbits (n 31) passim. 39 S Greengus "Legal and social institutions of ancient Mesopotamia" in Sasson (n 32) 469-484 at 475. 40 Discussions of the qualities of multisensory communication by Greengus (n 39) passim; Hibbits (n 31) passim; M Malul "Touching the sexual organs as an oath ceremony in an Akkadian letter" (1987a) 37 Vetus Testamentum 491-492; M Malul "Gag-ru sikkatam mahasum/retum 'to drive in the nail' and act of posting a public notice" (1987b) 26 Oriens Antiquus 1-19; M Malul "On nails and pins in old Babylonian Praxis" (1991) 13 Acta Sumerologica 237-248; M Malul "Silldm patarum 'to unfasten the pin'. Copula Carnalis and the formation of marriage in ancient Mesopotamia" (1991-1992) 32 Ex Oriente Lux 66-86; Malul (n 30) passim; M Malul The Comparative Method in Ancient Near Eastern and Biblical Legal Studies (Neukirchen, 1990) passim; Malul (n 3) passim; PA Kruger "Nonverbal communication in the Hebrew Bible: A few comments" (1998) 24 J of Northwest Semitic Languages 141-164; MI Gruber Aspects of Nonverbal Communication in the Ancient Near East (Rome, 1980) passim; and RA Barakat "Gesture systems" (1969) 14 Keystone Folklore Quarterly 105-121 regarding symbolism reveal different perspectives in the analysis of the performance law of the ancient Near East and the applicable old Babylonian legal tradition. 41 Hibbits (n 31) at 874. 42 Apart from symbolism in legal studies, scholars could also focus more on iconography to explain certain aspects of old Babylonian life. See J Nijhowne "Politics, religion and cylinder seals: A study of Mesopotamian symbolism in the second millennium B.C." (2003) 62 J of Near Eastern Studies 306-308 who looks at the iconography of images and wording of certain groups in Old Babylonian and Kassite glyptic and theorises accordingly on the variations in terms of political and religious events. 43 See AL Oppenheim Ancient Mesopotamia Portrait of a Dead Civilization (London, 1964) at 283 who refers to legal documents as a mirror. 44 Westbrook (n 36) at 4-5, in his study of ancient Near Eastern law traditions, refers to the term "source," which includes "historical records" and archaelogical evidence which seems to refer to proof of "legal authority". The "historical records" are written records, which in turn serve as "evidence of legal rules and institutions", while "legal authority" refers to written and unwritten norms derived from court decisions. The validity of both of these views is tested from different perspectives: the test of the historical point of view is its credibility and that of the "jurisprudential" point of view its "authoritativeness" (idem at 4). The historical records in Mesopotamian law are not extensive for there are different sources that verify the abundance of Mesopotamian law in certain periods whereas sources are almost completely lacking in other periods. These documents are to be found mainly in the old Babylonian and Neo-Babylonian/Persian period (idem at at 5). The validity of historical documents depends on their credibility, the criterion being twofold, namely "direct or indirect evidence of legal norms" and "the self-consciousness with which a source presents the law" (idem at 6). The evidence of legal norms should be viewed carefully for there could be a biased representation of the facts and as Westbrook (idem at 6) opines: "[T]he more incidental a value judgment of law in question is to the purpose of the source, the less it is likely to be biased in its report." 47 See Claassens (n 7) vol 1 at 79-104 in which the elements of the family deceased division agreement relating to scribal schools are outlined and the recorded agreement's limitation to selected information is explained. In addition the development and practical function of scribal schools are discussed, with an introduction to the lexical and grammatical texts called ana ittisu, and the different scribes and languages used in written mediums. 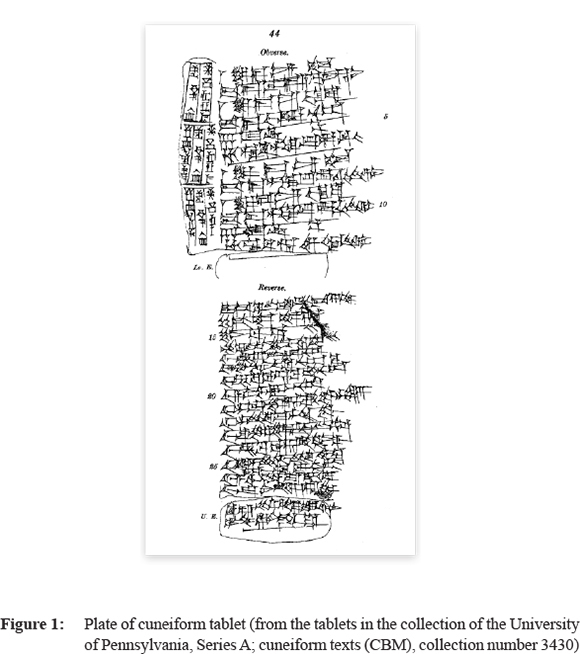 In the thesis an outline is also provided of the different approaches to the study of scribal school tablets, including the categorisation of E Robson, namely the traditional approach of scribal training, the recent focus by scholars on the physical tablets and typology, as well as the archaeological findings regarding scribal training and the school's cuneiform tablets for education purposes ("The tablet house: A scribal school in Old Babylonian Nippur" (2001) 95 Revue d'Assyriologie at 39-66; see also Claassens (n 7) vol 1 at 89-96). 48 See Pearce (n 32) at 2265-2278. Although Mesopotamia was predominantly a preliterate society, there is evidence of a good "record-keeping system" to support the temple business and other commercial business activities which became more complex as the population grew. Thousands of so-called commercial records have been excavated which include receipts, disbursements, inventories, loans, division agreements, leases, partnership agreements and dissolutions and guarantees: see OR Keister "Commercial record-keeping in ancient Mesopotamia" (1963) 38 The Accounting Review at 371-376. Keister examined these so-called commercial records found in temples and private businesses. He made special reference to debt records, rentals or leases and expenditure accounts and showed that even in their variety they gave information in much the same order as the clay tablet. 49 Although Sumerian had become obsolete as a spoken language, it was still used as a written language. P Michalowski "The life and death of the Sumerian language in comparative perspective" (2000) 22 Acta Sumerologica 177-202 at 178 avers that we "cannot simply ask the usual question: 'when did the language cease to be spoken?' or, as some would prefer to phrase it: 'when was it no longer understood in vernacular conversation?'" For him this is a "complex matter" and "several different modes of investigation" may be followed. He concludes that it is therefore better not to ask this question, but rather to continue investigating the "various lives" of the Sumerian language (idem at 198, 177-202). The ongoing debate at the time when the Sumerian language became obsolete increased the role of scribal schools as learning institutions: see C Woods "Bilingualism, scribal learning, and the death of Sumerian" in S Sanders (ed) Margins of Writing, Origins of Cultures Unofficial Writing in the Ancient Near East and Beyond (Chicago, 2006) at 111-112. For Woods (at 112) it seems that schools were such institutions. They did, however, still have a "functional sense of a scribal curriculum". Thousands of Sumerian exercise tablets served as testimony that these tablets were "products of scribal training". He added that there was an oral component in training and that students were "instructed and drilled orally" by means of dialogues. The language of instruction was Sumerian or a mixture of Sumerian and Akkadian. Sumerian was even spoken in the schools in normal communication as part of the "scholarly milieu". The majority of literature writings were in Akkadian, although the language of learning was Sumerian. The children had to master the Sumerian language and a proverb stated that "dub-sar eme-gir15 nu-mu-un-zu-a a-na-am dub-sar e-ne" (English tr: "A scribe who knows no Sumerian, what sort of scribe is he? "): see AR George In Search of the e-dub-ba-a The Ancient Mesopotamian School in Literature and Reality (2005) http//eprints.soas.ac.uk/1618/1/ GeorgeEdubbaa.pdf at 2; Woods supra at 112-118. In ancient Mesopotamia, however, the long life of written Sumerian and its co-existence with written Akkadian "guaranteed the preservation and expansion of these cultural elements, albeit within limited social circles". Hence, "Sumerian was a movable feast": see Michalowski (idem at 198). 50 By studying houses and archives, scholars established that scribal schools existed in city-states such as Nippur; and in Sippar the scribal school was discovered by studying the Ur-Utu archive in particular. See Claassens (n 7) vol 1 at 99-102; M Tanret "The works and days: on scribal activity in old Babylonian Sippar-Amnunum" (2004) 98 Revue d'Assyriologie 33-62. 51 See, on scribal traditions, Robson's categorisation, namely the traditional approach of scribal training; the recent focus by scholars on the physical tablets and typology; and the archaeological evidence ((n 47) at 89-96). The traditional approaches to study and school life are outlined by SN Kramer "Cultural anthropology and the cuneiform documents" (1962) 1 Ethnology 299-314; CJ Lukas "The scribal Tablet-House in ancient Mesopotamia" (1979) 19 History of Education Quarterly 305-332; Pearce (n 32) at 2265-2278; SA Meier "Women and communication in the ancient Near East" (1991) 111 J of the American Oriental Society 540-547; A Falkenstein "Die Babylonische Schule" (1953) 4 Saeculum 25-37. See also the typology approaches of SJ Tinney "Texts, tablets and teaching: Scribal education in Nippur and Ur" (1998) 40 Expedition 40-50; SJ Tinney "On the curricular setting of Sumerian literature" (1999) 59 Iraq 159-172; N Veldhuis "Elementary Education at Nippur: The Lists of Trees and Wooden Objects" (D Litt et Phil, University of Groningen, 1997) passim; N Veldhuis "Review of Cavigneaux 1996" (1997-1998) 44-45 Archiv fur Orientforschung 360-363; N Veldhuis "Sumerian proverbs in their curricular context" (2000) 120 J of the American Oriental Society 383-399; P Delnero "Sumerian extract tablets and scribal education" (2010) 62 J of Cuneiform Studies 53-69; and P Gesche Schulunterricht in Babylonien im ersten Jahrtausend v. Chr. (Munster, 2000) passim. These scholars focus on physical tablets, not on the texts. The archaeological evidence is presented by various contributions; see, eg, the discussion of scribal training by Robson (n 47) at 39-66; D Charpin Le clerge d'Ur au siecle d'Hammu-rapi (Geneve, 1986) passim; P Brusasco's discussion of scribal training in Ur in "Family archives and the social use of space in old Babylonian houses at Ur" (19992000)Mesopotamia at 3-173; Delnero's study of archaeological evidence for scribal education in the Mesopotamian cities of Isin, Kish, Babylon, and Uruk (supra at 53-69); Tanret's study (n 50) at 33-62 of the gala-mahs's house in Sippar Ammanum; and EC Stone's Nippur Neighbourhood (Chicago, 1987) passim, being a study of certain houses and scribal activities in Nippur. 52 Usually one record of the written transaction was left in the keeping of the party who won the lawsuit or the one to whom the money was paid out. This document was placed in a clay envelope: on its surface, a summarised version was written. See Greengus (n 39) at 475. 53 Scribes, scribae, transcribers and notaries throughout the centuries have had more or less the same functions. See Pearce (n 32) at 2273 who considers Mesopotamian scribes as notaries as well as witnesses. NP Ready Brooke's Notary (London, 2002) at 1-9 gives an insightful synoptic historical outline of scribes or notaries, who during the Roman period were public officials, and scribae who acted as copiers and transcribers. Later their technical knowledge and skill played an important part in public and private matters. These scribes were engaged in the drafting of various documents; see Ready (idem at 1). Today these scribes are legal officers who draft certain documents including wills, testamentary documents, conveyancing documents of real and personal property and powers of attorney. Their duties also include "authenticating" a drafted document under their signature and official seal (idem at 21).The work of a notary is considered a reserved legal activity (idem at 22). See, also, RC Elliot The South African Notary (Cape Town, 1969) at 1, who states that a notary in South African law is a public officer appointed by the Supreme Court who is by statute required to be an admitted attorney. In South Africa, according to the relevant statute, after passing his/her examinations, a notary must apply to the Supreme Court for appointment as an officer of the court and must already have been permitted to practise as an attorney: see FE van der Merwe Notarial Practice (Durban, 2001) at 6-7. A notary has a duty to apply skill, care and diligence in the drafting of documents, the verification of the identity and capacity of contractual parties, and the fulfilment of a client's instructions: see Elliot (idem at 35). An attorney who is also a notary who undertakes any drafting work which is not notarial work is still expected to exercise the same degree of skill as a notary in a "high tradition of honesty and reliability" and may be held liable for damages for a breach of the tradition and skill required of a notary (idem at 1-2). 54 If it was an individual who was not a scribe by profession, the context of a written agreement was direct and informal. Reference was then made to such a person. The majority of division agreements were written by professional scribes. 55 A Epstein Contract Law Fundamentals (Ohio, 2008) (see especially at 224-244) is a practical guide for drafters of contracts of today and the author discusses drafting suggestions and techniques. Drafting a contract today is considered an "art that requires skill and foresight". the parties' intention must be clearly stated to prevent disputes in the future (idem at 225). The use of proper and plain language and the avoidance of ambiguity is advisable (idem at 226-227). Epstein (idem at 228) suggests that drafters find models in books or in other contracts, when preparing a contract, remembering that there is "no perfect contract" and that drafters "need to pick the best from a variety of sources to suit needs"; and that they should also use computer software and bear in mind the role of the internet in drafting and communication. 56 Written records served as a summary of findings and legal actions were written in the third person. Legal documents served as "formal records of legally valid transactions which took place in an oral or non-literate context". As with some "important" declarations or statements in legal documents, these are sometimes quoted in the first person: see Greengus (n 39) at 475. 57 The scope of this article does not permit the discussion of the different clauses and their terminology but these are outlined in Claassens (n 7) vol 1 at 151-210. These clauses include the mutual agreement clause, inheritance clause and beneficiary clause. In the mutual agreement clause the Sumerian terms ba, se-ga-ne-ne-ta, and Akkadian term i-zu-zu (zdzu(m)) are found. In terms of the inheritance-clause heading the meaning of the Sumerian term hal-ha and the Akkadian term zittu(m) and in respect of the beneficiary clause the Sumerian term ibila are present in the division texts. 58 See n 15 supra for a discussion of the natural elements. The scope of this article does not allow for an extensive treatment of these elements. 59 See HWF Saggs Babylonians People of the Past (Berkely, 2000) at 55, who states that the written recordings characteristically contain "very condensed phraseology and are full of technical words upon which the exact sense turns but which scholars at present understand only approximately". 60 Veenhof (n 36) at 147. 61 Private legal documents consist of "an objective description of the transaction", witnesses, date formula and the seals of some of the witnesses and contractual parties: see Westbrook (n 36) at 362; and with reference to the date formula see n 73 regarding the discussion of date formulas which include those of numbers and those of dates. 62 Oppenheim (n 43) at 25. 63 Today specialisation in contracts regulated by different fields of law exists, such as employment law, consumer law, land law and commercial law; however most scholars agree there is at least a "general law of contract": see R Stone The Modern Law of Contract (New York, 2008) at 15-18. 64 Although an oral agreement may be used in modern contract law, it is not advisable - for the oral agreement, terms must be proved. Oral contractual agreements are entered into on a daily basis; however, the more complex a contract and its terms, the more likely it is that the parties will include all the terms in a written contract: see Stone (n 63) at 249. Furthermore, in modern law oral agreements are permitted, although there are a few statutory provisions that require a written agreement, for instance, in South African law a family deceased agreement (redistribution agreement) involving immovable property, alienation of property, etc. In a dispute today regarding the terms of a contract the courts look further than a "meeting of the minds" to clarify the details of an agreement (idem at 33). Modern courts have an "objective approach" and make assessments based on the perspectives of a reasonable person about what was said and done regarding the terms of the agreement (idem at 33-34). It may be assumed from the legal cases of the ancient Near East that a similar approach was followed because of the decisions made by the judges in accordance with the few details provided in their written court records. 65 Regarding the interpretation in modern contract law, appropriate language use is essential to establish the meaning of clauses: see Stone (n 63) at 260. Here the so-called "parole evidence rule" may be used where contractual parties can argue that a certain part of the written agreement is pro non scripto or the interpretation of a part renders it inconsistent with its normal meaning. Drafters (lawyers) are therefore trained to draw up contracts with clear and explicit terms (idem at 261). One of the few exceptions to the rule is where a party can prove that not all the terms of the contract are intended to be included in the agreement: for instance, a document concerning the sale of a horse could actually be just a receipt, not a sales agreement per se (idem at 261). The so-called contra proferentum-rule is used in contracts to limit the effect of exclusion clauses where a contractual party uses very precise wording to avoid liability. This rule is applied to a contractual party who is also the drafter of the contract. It is effectively used in insurance contracts and contracts that contain liability or negligence exclusions (idem at 297-301). 66 The problems concerning the interpretation of protocols require more study. For instance, it may be asked who were involved in conferring so-called "preference shares": was it the decision of the head of the family only, or was there pressure from society to determine how the assets in a city-state should devolve? 67 Cf Claassens (n 7) vol 1 at 39-41. 68 The different theoretical and practical legal practices and comparisons between the city-states are discussed in Claassens (idem at 387-410) regarding the final conclusions reached. 69 The average written legal record consists of a formalised summary of the proceedings accompanied by a recording of the date, names of witnesses and oaths (if any) taken, together with the names of the judges presiding in the case: see Greengus (n 39) at 475. 70 Witnesses in modern law are accorded a different value from that in old Babylonian Larsa, Sippar and Nippur. In modern law it is not imperative to have witnesses to an the agreement: see R Sharrock Business Transactions Law (Cape Town, 2007) 112. However, in South Africa and other western countries it is a requirement in documents such as wills. The signatures of witnesses in modern contracts confirm the "authenticity" of the contracting party's signature if that signature is later disputed (idem at 112). In the ancient Near East a scribe and witnesses would seal the written transaction and envelope together with the signatories (Greengus (n 39) at 475). In modern law the signatures of the contracting parties are obligatory although in the majority of documents the date and place are not required, but considered useful (Sharrock idem at 112). See Van der Merwe et al (n 25) at 152-162 who states that as a general rule it is not a formal requirement that a contract be written (in the absence of particular provisions in a statute); however today a written contract with signatories is "commonly" required to authenticate the contractual party's identity (idem at 153). Thus the value and function of an ancient Near Eastern witness differs profoundly from those of today's witnesses. The latter authenticate the identity of the signatory and do not play a part in the testifying to the terms and facts of the agreement. In the ancient Near East the agreement was reached in front of persons who were witnesses to the terms and conditions together with the scribe who could testify to the terms and conditions of the agreement, especially those not included in the written record. One interesting parallel between the court in the ancient Near East and the modern court is the role of the "court assistant," a lower-level royal official or sometimes a soldier, who like the modern-day bailiff escorted unwilling parties to the hearing and enforced judicial directives and decisions: see Greengus (n 39) at 475. 71 The parties and witnesses sealed the document by stamping their seals on the surface: see Greengus (n 39) at 475. 72 In the middle Babylonian period those documents that lacked seals had impressions on them, made by the use of fingernails on the hems of garments and placed next to their names of the contracting parties and/or witnesses. Originally, it seemed that the witnesses were predominantly male, but in the old Babylonian period women also served as witnesses. In the Neo-Babylonian period it seems that women could not serve as witnesses, but their presence at the proceedings was noted. Nevertheless, in all periods women had full contractual capacity to own, buy and sell assets, although in the Neo-Babylonian period only via a male relative. Slaves appeared as witnesses or contracting parties at Nuzi in the Neo-Assyrian and Neo-Babylonian documents (Greengus (n 39) at 475). 73 The date when the oral division agreement was recorded and witnessed is referred to as a "date formula", for unlike our "date-system" the old Babylonian (ancient near East) dates were reflected and considered as a formula. There are variations of dates regarding the names and numbers; however, the division agreement contained a year name date formula. In the year date formula of a division agreement the king had normally done something significant. See A Westenholz "Early Nippur year dates and the Sumerian king list" (1974) 26 J of Cuneiform Studies at 154-156; MJA Hornsnell "The grammar and syntax of the year-names of the first dynasty of Babylon" (1977) 36 J of Near Eastern Studies at 277-285 who made some observations in order to clarify the grammar and syntax of the Sumerian year names. 74 See in this regard S Greengus "New evidence on the old Babylonian calendar and real estate documents from Sippar" (2001) 121/2 J of the American Oriental Society 257-267, esp at 264 and the contrasting view of WF Leemans "The family in the economic life of the old Babylonian period" (1986) Oikumene 5 at 15-22. In Claassens (n 7) vol 1 at 35-39 there is a discussion of the characteristics of the Mesopotamian legal tradition with special reference to the kinship relationship as well as an outline of different opinions on the obligations of a kinship relationship as against the contractual ability of members of a family based on free will and bargaining. 75 See the discussion of this named term "natural elements" (Claasens (n 7) vol 1 at 127-131).